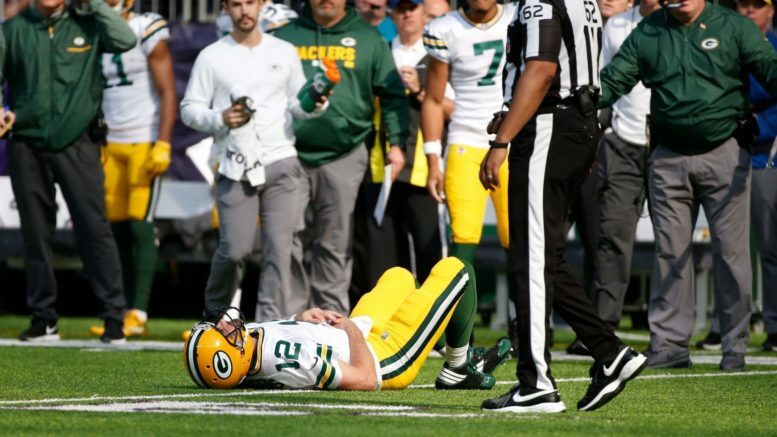 Aaron Rodgers was placed on IR, short-circuiting a return in which he was picked off three times in a loss to Carolina. So Aaron Rodgers wasn’t coming back to save the Packers, huh? After a losing effort in Carolina, the Packers are officially eliminated, Rodgers has been shut down for the rest of the season. Truthfully, the only reason I could’ve imagine that he wouldn’t have been shut down is because Packers brass wants to save face with how they handled rushing him back from a broken collaborate. It’s not fully healed, yet the Rodgers-to-the-rescue storyline worked four years ago, so Green Bay figured they’d give it another go. It is the right move, because had Rodgers not been held out of the final two games, that not only would have been incredibly foolish on the Packers’ part, but equally stubborn. Own up to your mistake and focus on the future of the franchise without jeopardizing the health of one of the game’s best quarterbacks. Now, it’s on to 2018 for Green Bay, ending a string of eight consecutive playoff appearances. Don’t believe in conspiracy theories? That’s okay, they aren’t for everyone. Since we wouldn’t want to upset Patriots fans, who haven’t had enough to cheer for in the 21st century, let’s beat around the bush to say what we mean. The Pittsburgh Post-Gazette deftly pointed out that Al Riveron, the senior VP of officiating, has had a hand in three critical touchdown calls that have directly contributed to New England wins this year. Brandin Cooks’ game-winner against Houston was upheld despite the ball appearing to move when he hit the ground. Austin Sefarian-Jenkins was ruled to be fumbling the ball when he crossed the goal line in the Jets’ eventual 24-17 loss to New England in Week 6. And then, the Jesse James fiasco (that sounds like a bad movie sequel) last week, followed by a complete flub by the Steelers. It is true that in a given year, the Bears or Cardinals could get three calls overturned in their favor for wins, but would that get any kind of national attention? Of course not. A league that has made feeble attempts to curb the Patriots’ dominance that has caused waning interest in the sport hardly seems cognizant of how these calls are further alienating its audience. For every Patriots fan that complained about the bad publicity around Spygate (“everyone does it!”) and Brady’s Deflategate Suspension (“Free Brady!” and “Goodell is a Clown!”), there have been exponentially more controversial moments that have broken in their favor. It started with the Tuck Rule in 2001. Accusations of cultivating unplayable field conditions to slow the Colts’ mighty offense down in 2004 (the Colts later returned the favor by cranking up the RCA Dome heat to slow down flu-stricken players in 2006). There was Rex Ryan’s timeout in 2007 that saved their undefeated season. There have been championship games in which their opponents superstar players were wounded (Rivers and Tomlinson in 2007, Bell last year). Billy Cundiff and Lee Evans (no further explanation needed). Maybe there are no conspiracies, and maybe everyone who is sick and tired of New England is a mere “jealous, crybaby hater.” But you can’t have your cake and eat it, too. The real victim in the Patriots’ frantic win over the Steelers is the Jacksonville Jaguars. The 10-4 Jags finish with two winnable games against San Francisco and Tennessee, albeit both on the road. Had the Patriots lost (and presumably trampled the Bills and Jets), the Jags would still be in position to usurp the bye week from New England with two wins of their own due to a conference record tiebreaker. Instead, the victory locks down New England’s eighth straight bye week, an NFL record. The Jags certainly have the defense to win on the road in the playoffs, but asking an unproven playoff team to win road games against both the Steelers and Patriots is asking far too much. Just winning one of those games would be a massive milestone for an organization that hasn’t had anything to celebrate in a decade. But, if there is one tiny, minuscule nugget of hope, it’s that the Jags possess the services of perhaps the one man capable of outsmarting Bill Belichick. Tom Coughlin is no longer coaching, but his stamp is ever-present on this young Jaguars team, and Doug Marrone is doing an outstanding job of not only saving this team from the depths of despair, but making them believers that they can compete with the league’s elite. The NFC playoffs may be the best conference tournament the league has seen this century. I can’t remember a field this deep and talented since at least the 90’s. There was the 2003 AFC landscape, which had the Titans and league co-MVP Steve McNair as a 12-4 wild card team among a field that included the Patriots, Peyton Manning-led Colts, 13-3 Chiefs, and Jamal Lewis running wild for the Ravens. But this year’s National Football Conference playoff field is something else. The Eagles, despite the loss of Carson Wentz, look plenty of capable of earning a Super Bowl berth behind Nick Foles. The Vikings bring an elite defense and one of the league’s rare rags-to-riches quarterback stories since Kurt Warner with Case Keenum’s incredible rise to prominence. The Rams almost feel like an afterthought at 12-4, but this almost feels like the last time the franchise completed a turnaround from 4-12 to division champs… when they won the Super Bowl after the 1999 season. New Orleans, Carolina, and Atlanta are all capable of making a run out of the NFC South, and it’s entirely possible that one of those teams ends up on the outside looking in (likely Atlanta, the defending conference champs). Seattle, Dallas, and Detroit all sit at 8-6 and it isn’t out of the question that one of those teams could catch fire thanks to top-level quarterbacks. They all might be a stretch for the Super Bowl, but the point is that as many as nine of the conference’s 16 teams could conceivably be the NFC representative in February in Minneapolis. The AFC looks awfully top-heavy, with New England the clear-cut favorite. The Steelers, Jaguars, and at a much longer shot, the Ravens and Chiefs, will have their work cut out for them in a field led by the most dominant franchise in major professional sports. Whoever faces the Patriots (presumably) in Super Bowl LII will have absolutely earned it and then some. Don’t sleep on the Panthers, who at 10-4 may not win their division, but are just two years removed from a 15-1 season that ended with an NFC championship and an MVP trophy for Cam Newton. The Panthers beat the Patriots in Foxborough in Week 4 and also boast wins over the Vikings, Lions, Falcons, and Packers. What’s interesting about the NFC is that the greenest quarterbacks in terms of postseason experience are the ones manning teams with the top seeds. Foles, Keenum, and Jared Goff have combined for a grand total of one postseason start. The “other guys” are led by Drew Brees, Russell Wilson, Matt Ryan, Matthew Stafford, Dak Prescott, and Newton. Minus Stafford and Prescott, who have yet to win a playoff game, the other four QBs have combined for five Super Bowl appearances and two wins. Looking for a potential feel-good story in the AFC? Look no further than western New York, where the Bills have a shot at breaking their 17-year playoff drought despite a ton of ups-and-downs this season. Tyrod Taylor has responded with plenty of resolve after being benched, rather ridiculously I might add, in favor of Nathan Peterman. Despite some awful performances at midseason, the Bills are 8-6 despite Taylor’s own struggles, a rookie head coach, and a never-ending role as little brother in the Patriots-dominated AFC East. But unfortunately, it could very well be those Patriots who dash Buffalo’s little-engine-that-could hopes. Tom Brady is 27-3 lifetime against the Bills, and one of those losses came in a meaningless Week 17 game in which he only played a half. With the Ravens a virtual lock to win their last two games against the hapless Colts and Bengals, Buffalo is going to need some help to break their eternal January dry-spell. Should the Bills and Titans both finish 9-7, it will depend on which of the final two games Tennessee loses to determine the tiebreaker. If the Titans lose to the Rams but beat the Jaguars, they will have the conference-record tiebreaker. If it comes down to the common opponents tiebreaker, the Bills would have the edge. The Chargers are also in the mix, because if they end up tied at 9-7 with Buffalo, they get the edge based on their 54-24 bashing of Buffalo in the game started by Peterman. Of course, Buffalo has never won a game at Gillette Stadium against a Tom Brady-led team in a meaningful game, but now would be a good time to start (for the record, they are 12-point underdogs). Week 17 is no cupcake either, however, with a trip to Miami following their trip to Foxborough. If the Bills are going to finally break through and join the postseason party, they’ll really have to earn it. Be the first to comment on "NFL Week 15 Roundup: Rodgers Not to the Rescue; New England Plays Patriot Games With Steelers"